BGP handles over 100,000 routes in the internet and it is doing a very good job in doing so. I tried doing the "show ip bgp" command on our internet router with a Public AS and takes quite a long time to show all the prefixes. I have to hit the space bar a lot of times. You can imagine how much CPU this number of routes will take on the router. Limiting the number of prefixes received from a BGP neighbor is one of the best ways to make sure these mistakes never affect the whole internet. The best practice is to check the number of prefixes received from a neighbor and then give a little allowance on the number of prefixes allowed. R1 on the diagram below is announcing prefixes to R2, let's see what happens if these prefixes reach the limit and what happens if it exceeds the limit. Let's see how many prefixes R2 learns from R1. It's learning 100 prefixes from R1. 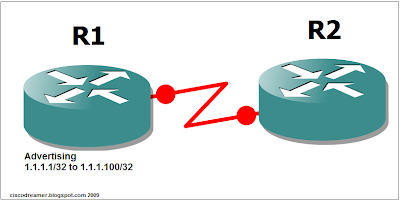 Now lets configure BGP so that R2 will only allow 101 routes from R1. The command we will use is "neighbor neighboraddress maximum-prefix number ". Let's advertise one route to BGP in R1. I will configure as well a static route pointing to Null0, to make sure the new route will be advertised. I didn't configure any loopback addresses on R1. Let's see how R2 reacted to this configuration. Oh, it reacted by generating a log message that the number of prefixes learned from R1 has reached its maximum. Lets add one more route in R1 and see what happens. Let's check R1 and R2 syslog messages. This time it gave also a notification in R2 and also generated a hexadecimal code. ( I have yet to review what this means :)) Right then and there, when it exceeded the limit R2 dropped the peering to R1. Let's see what the BGP table summary looks like after the violation. The state is in Idle and included a description (PfxCt) which means the neighbor exceeded the prefix limit set. The peering will only be established once the prefixes goes below the threshold set and "clear ip bgp *" needs to be issued to renegotiate the connection. Again, this command is very useful to protect your own AS from over flooding of prefixes and protect other ASes as well. 4 Responses to "BGP Maximum-Prefix"
it is not necessary to notify the MAX prefixes just when it reaches the MAX of its configured value !! is a message shown on my IBR router, just when the peering keeps advertise the prefixes continually!!! By default it will generate a syslog message when its 75% of the limit set. You can also set a threshold if you want for you to be alert of an impending issue. I intend it to be 75% so i dont need to put any value in there. this text saved me today ! (PfxCt) helped me find you !